Hyperform Inc is an All-American success story. What started out as a maker of products for the surfing industry like surfboard fins and traction pads has transformed itself into a hugely successful manufacturer supplying, as its primary business, the marine industry with innovative, functional, and aesthetically pleasing PE/EVA non-skid decking products. PE/EVA (Polyethylene/Ethylene-Vinyl Acetate) is a closed-cell blended foam material that is soft yet durable, and SeaDek has developed a unique formula that is resistant to UV rays and the harsh conditions of the marine environment. Hyperform utilizes PE/EVA as decking (and a variety of other applications) in its SeaDek Marine Products line, its SwimDek aquatic surfaces line for the pool and spa market, and coming soon, the EndeavourDek line for automotive, off road, and multiple other applications. All are alternatives to fiberglass molded-in non-skid, painted-on textures, and other traction products currently available. 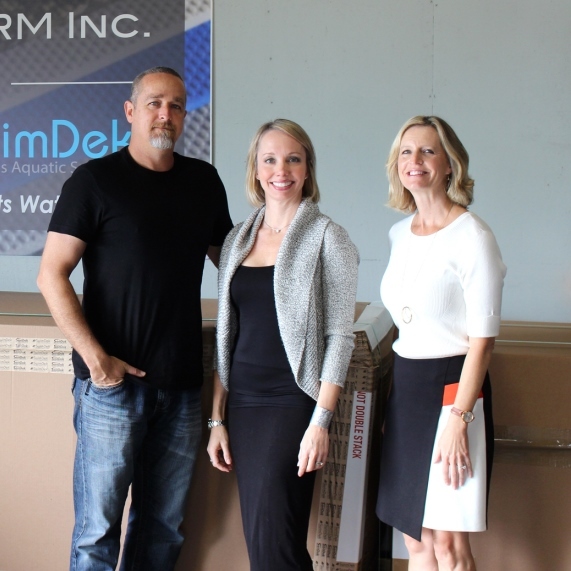 Hyperform benefits from a strong group of seven principal owners and a dedicated workforce. At the helm guiding the company through its dramatic growth and playing key roles among the principals are President Kurt Wilson, Chief Operating Officer Serenity Gardner, Vice President of Marketing Jason Gardner, and Vice President of Sales Chuck Yates. In 2015, the principals of SeaDek extended ownership to over eighty full-time employees through the implementation of an Employee Stock Ownership Program (ESOP). It’s that team that’s making success happen at the company, say the Gardners. Hyperform turned to the Florida SBDC at the University of Central Florida (FSBDC at UCF) and its International Trade Services consultant Jill McLaughlin for assistance. The company applied for and was accepted into the FSBDC’s Export Marketing Plan service. Provided in partnership with Enterprise Florida and the U.S. Commercial Service, the program is focused on assisting qualified new-to-export manufacturers and service providers with overseas growth strategies through the development of customized Export Marketing Plans. These customized Export Marketing Plans provide comprehensive industry and market analyses, with target market recommendations and country specific market entry strategies.